THe airport in Nice had a stand to put my bike together, which was awesome. I was on almost no sleep, though, and there was so much to put on my bike that it took me about 3 hours. I was very frustrated and almost wanted to turn around and go home. But I finally got it together and was ready to go. 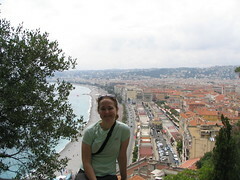 I spent two days in Nice and was able to walk around the city, thanks to my wonderful host, Christelle from Warm Showers.org. 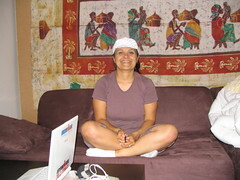 I gave her a Laek House hat for her generous hospitality. Nice was really beautiful and I was so glad to have the two days to get myself ready for my tour. Christelle was the best host I could have hoped for!!! 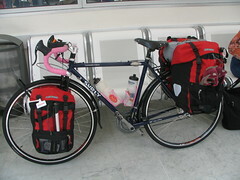 any idea how many lbs of gear you’re hauling up them thar hills? 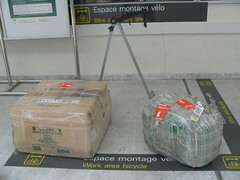 When they weighed my boxes at the airport, I think my bike was like 23 kg, including some random stuff like shoes = you can see in the photos. My bags were 18 kg. I want to go to a truck weigh station and weigh the whole thing but I have not found one yet. I think a truck weigh station would yell at you, at least they would in the states. That would be interesting to try. It’s cool you found such a nice host. Your bike looks really heavy, but you can do it. Finally getting a chance to carrouse your blog now that I have free internet for hours! THus, i wanted to say: Your Bike Is BEAUTIFUL!